This dark green gourmet oil is cold pressed from the tiny seeds of grapes. It tastes of grape, marc and nuts. It is regarded as an all-round talent in the kitchen - ideal for frying and for cold dishes. 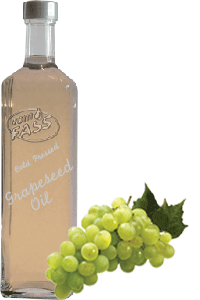 Grapeseed oil has a pleasant aroma, a silken texture, and a great absorbtion rate for cosmetic usage. Generally employed as a base oil for many creams, lotions and as a general carrier oil. Grapeseed is especially useful for skin types that do not absorb oils too well, and it does not leave a greasy feeling. Wonderful for those with skin sensitivities because of its natural non-allergenic properties.